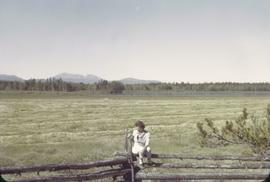 Image of a woman seated on a wooden fence in the Chilcotin region of BC, with a grassy field behind her and mountains in the far distance. Item is the first of eight audio recordings of George Myers of Riske Creek, British Columbia singing in the Chilcotin language, with drum accompaniment. He speaks in English in between songs about his spiritual beliefs and work as a medicine man. Item is the second of eight audio recordings of George Myers of Riske Creek, British Columbia singing in the Chilcotin language, with drum accompaniment. He speaks in English in between songs about his spiritual beliefs and work as a medicine man. Item is the third of eight audio recordings of George Myers of Riske Creek, British Columbia singing in the Chilcotin language, with drum accompaniment. He speaks in English in between songs about his spiritual beliefs and work as a medicine man. Item is the fourth of eight audio recordings of George Myers of Rikse Creek, British Columbia singing in the Chilcotin language, with drum accompaniment. He speaks in English in between songs about his spiritual beliefs and work as a medicine man. Item is the fifth of eight audio recordings of George Myers of Riske Creek, British Columbia singing in the Chilcotin language, with drum accompaniment. He speaks in English in between songs about his spiritual beliefs and work as a medicine man. Item is the sixth of eight audio recordings of George Myers of Riske Creek, British Columbia singing in the Chilcotin language, with drum accompaniment. He speaks in English in between songs about his spiritual beliefs and work as a medicine man. Item is the seventh of eight audio recordings of George Myers of Riske Creek, British Columbia singing in the Chilcotin language, with drum accompaniment. He speaks in English in between songs about his spiritual beliefs and work as a medicine man.